A new Policy Brief from the United Nations University Institute for the Advanced Study of Sustainability (UNU-IAS), host of the IPSI Secretariat, provides guidance for policymakers interested in incentive systems to encourage SEPLS management. 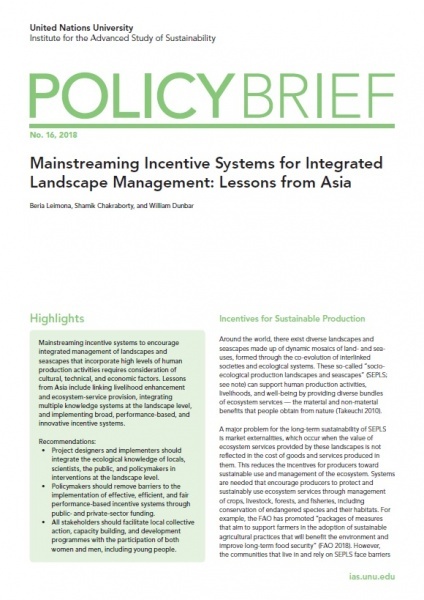 The brief, Mainstreaming Incentive Systems for Integrated Landscape Management: Lessons from Asia, is written by UNU-IAS experts Beria Leimona, Shamik Chakraborty, and William Dunbar. It investigates incorporation of multiple knowledge systems, removal of policy barriers, and encouragement of local collective action in terms of incentive systems for SEPLS. This brief presents some of the outcomes from last year’s Satoyama Initiative Regional Workshop in Sabah, Malaysia. All IPSI-related people are highly encouraged to have a look at the brief, which provides a great deal of insight on SEPLS management practices and concepts. The policy brief is available for download on at UNU Collections here.